Improves the booking experience with an optimized medical agenda system, allowing users to make reservations with a few clicks without the need of waiting lists while at the same time notifies the user if there is a released slot. Med360 also allows the user to cancel and confirm attendance to an appointment as well as to receive personalized notifications in his or her cellphone in case of delay or blocked hours by the doctor. 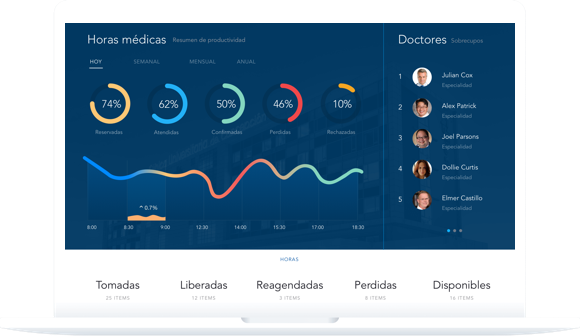 Manage your agenda online, from anywhere and make adjustments and configurations notifying immediately to the patients. Also defines priorities with an overbooking assignment criteria or released hours to assign. Real time notifications if there is any inconvenient or emergency. Improve the assistance of your medical consultations thanks to our overbooking optimization system. Lower your assistance confirmation costs and automatically offer free hours to other patients, thanks to our virtual waiting list. Download in real time management information to optimize assistance to patients. With Med360 you will have a world of possibilities for your patients, doctors, and clinics to go one step further into the digital world.